Stressed out? — do foundation practices, including meditation. No time to meditate? — give up some TV time. Too many commitments? — meditate precisely and concisely. After giving up TV, still too busy to meditate? — meditate anywhere you can, even when walking the dog. Still too busy? — you’re making excuses. The outer preliminaries are various meditations on death (impermanence), karma, suffering and human birth — and are designed to motivate practice. 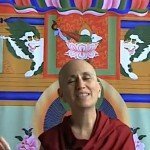 All of these practices create “merit” and positive karma. 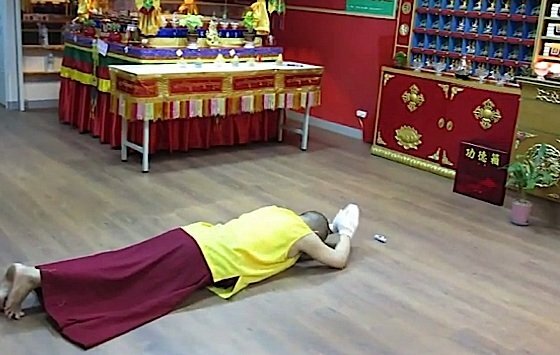 Prostrations: These are done to the 35 Buddhas, together with reciting their names and the confession prayer. Vajrasattva (Dorje Sampa) mantra: This is done with the Vajrasattva practice and visualization. Refuge: This is reciting Namo Gurubhya, Namo Buddhaya, Namo Dharmaya, Namo Sanghaya while visualizing the field of positive potential. Mandala offering: This involves reciting the refuge and bodhicitta prayer and the mandala offering verse, while visualizing offering the entire universe and everything beautiful in it to the Buddha, Dharma and Sangha. Guru Yoga: This is meditating on the inseparability of the Buddha’s mind, our spiritual mentor’s mind and our mind, together with visualization and mantra recitation. Dorje Khadro (Vajra Daka): Imagining black sesame seeds as the negativities of ourselves and others, we offer them in a fire to the mouth of the fierce deity Dorje Khadro, who swallows them with pleasure as if they were nectar. 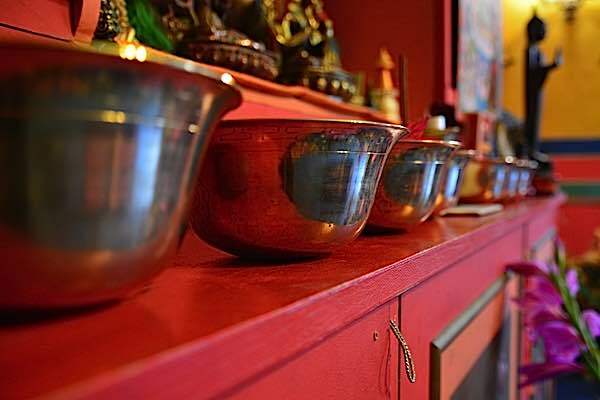 Water bowls: This is offering water bowls to the Buddha, Dharma and Sangha, together with visualization. Tsa-tsa: This is making clay or plaster images of the Buddha. Samaya Vajra (Damtsig Dorje) mantra: This is reciting the mantra of this Buddha together with visualization. Most of us, with a daily practice, still do foundations as a preliminary to our main meditation. In fact, most sadhanas (guided meditations) given by teachers at empowerments include all of: prostrations, taking refuge, mandala offering, guru yoga, water bowl offering, and Vajrasattva (Dorje Sampa) mantra. Pretty much the only preliminaries left out of typical sadhanas are Dorje Khadro and tsa-tsa making. The goal of Ngondro is nothing less than full Enlightenment, and many regard it as a “complete path” rather than preliminary to a higher practice. Many of us continue with Ngondro practices as their main practices virtually for life. Since these “preliminary” practices represent an entire path, it can take a lifetime just to complete them. Most of us would consider that a life well spent. 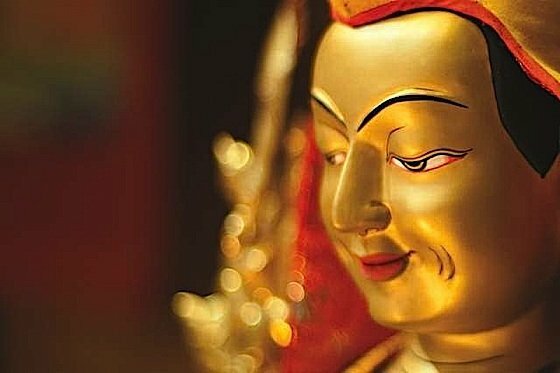 Famously, Lama Tsongkhapa spent many years on foundation practices and continued them all of his life. Ngondro (sometimes spelt Ngon-do) practices — and the broader umbrella of Lamrim, the Great Path to Enlightenment — are there to help us start out in Buddhist practice, yes; but they are also meant to be practised for life. Even a Vajrayana Buddhist practising Highest Yoga Tantra generation and completion still needs Ngondro as a regular practice, if only to settle the mind, motivate practice and focus our higher meditations. You never outgrow Ngondro. Taking refuge in the Three Jewels Buddha, Dharma and Sangha is a Foundation Practice of all traditions. meditating, as Shakyamuni instructed, on the suffering of beings in Samsara. 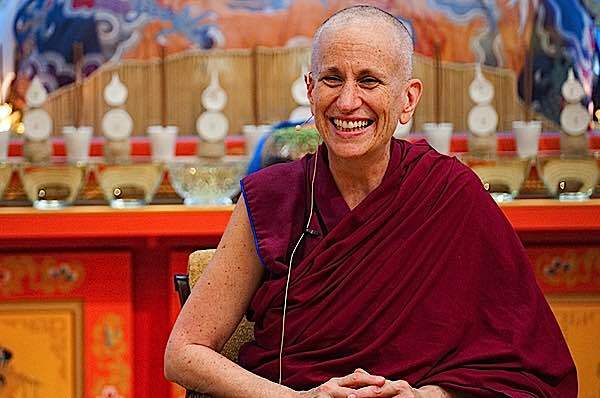 The four outer preliminaries are also called the “four reminders” or the “four mind-changers” — in other words, these are topics that should motivate us to embrace and practice Dharma with increasing commitment. The inner preliminaries, also called the “extraordinary” preliminaries feel more outer than inner — at first glance — because they represent various actions. However, they involve all of “body, speech, and mind”, also known as the “three vajras”, and they are designed to purify us within. In other words, these activities “cleanse” us — bring us to a state where we are ready to truly appreciate and understand and practice of both wisdom and compassion — to the point where we can develop realizations or insights. They are also designed to “accrue” merit as much as to remove negative karmic imprints. These inner preliminaries, in many schools, are repeated at least 100,000 times each — often in concentrated retreats, or just as an accumulation of merit in various sessions. In the Gelug school, a student can undertake preliminaries congruent with other higher practices, provided they continue the practice consistently. In other schools, the preliminaries literally must be fully completed first. Guru yoga — which purifies delusions. In other words, don’t wait for a teacher to start Refuge and Bodhichitta; they are fundamental to all Mahayana Buddhist practice. 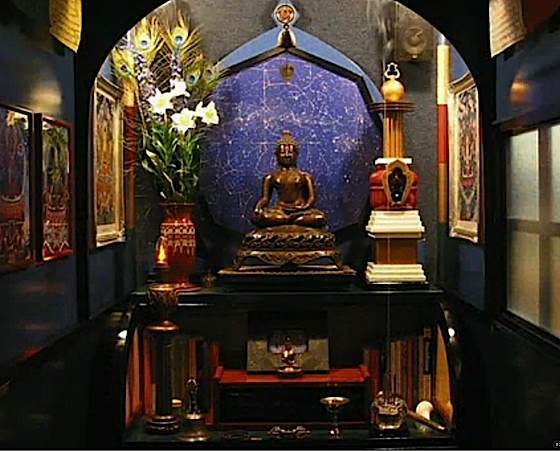 It is helpful, sometimes, to assemble an altar with an image of a Buddha, Stupa and Dharma (book, typically) and place offerings in front. 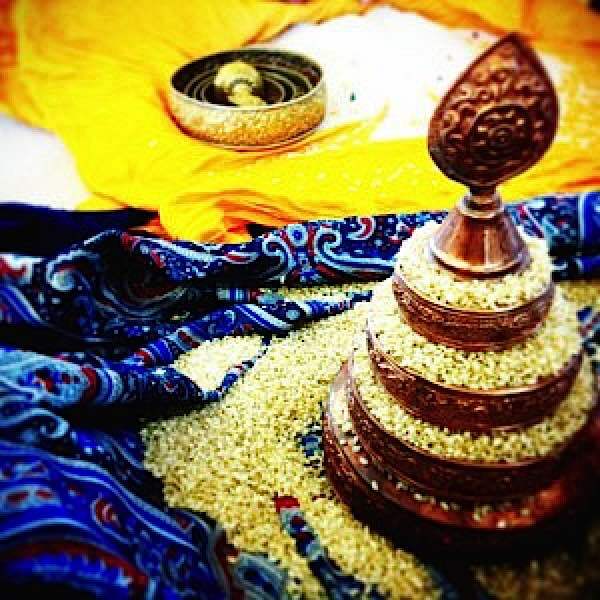 All preliminary practices can be done in front of the altar, including refuge, prostration, mandala offerings. Or, it they can be done anywhere, just simply visalizing in your imagination. Until I attain Enlightenment, I take Refuge in the Three Jewels, Buddha, Dharma and Sangha. By the virtues of practising Refuge, may I attain Enlightenment for the benefit of all sentient beings. Repeat 100,000 times, preferably with a prostration. Note: check with your doctor first, if doing prostrations, but if your health professional approves it is very good exercise! Combining this practice with mindfulness meditation — and, ideally — formal contemplation of impermanence and other “outer” preliminaries — is already a very strong daily practice that can only bring merit and help you purify delusions. “There are many levels for practising Foundation practices. 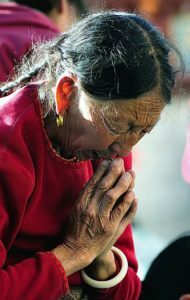 The Tibetan term for preliminary practices or foundation practice is called Ngondro (pronounced, more or less, Hoong-do). “Ngon” means preliminary preparation, and “do” means go. So, the preliminary practice, the Foundation practice has to go has to be done first. That’s the most important. If the preliminary practices, or foundation practices, is not properly done, or if there is a lack of solid foundation, then your practice will be a difficult one. Always, there will be obstacles, hindrances and difficulties. The simple example is, when you build a house, or a cabin, or put the yurt [large Mongolian tent]. In the yurt, if the foundation is not level, you can’t build. It will be lopsided. It doesn’t work. If there’s a wind it will be blown away or collapse if there’s a weight of snow — and so on. Also, if you’re building a house, you’re talking about long term. You want a house that will last for long term. So, if your foundation is not so good, you’ll have trouble over time. So, likewise, for Dharma practice, especially Vajrayana practice, it’s important to have a good foundation. This is why, in Tibet, in the old days, serious practitioners, like yogis, yoginis and lamas, disciplined themselves for many years doing foundation practices. For example, Lama Tsongkhapa himself did millions of prostrations. He did many mandala offerings. He was a simple Buddhist monk; on a material level, he was a poor monk. On a spiritual level, he was very resourceful. He took a vow of poverty. He didn’t even have a mandala plate [for offerings]. He couldn’t buy a mandala plate with the rings and so on. Instead, he did the mandala offering on slate — on a piece of rock. He used sand and pebbles. He did thousands and thousands of times. He did it so much he had calluses on his hand from the stone. He did lots of foundation practice.